My role as an Assistant Communication Officer in the Advocacy and Partnerships section requires regular field trips to UNICEF programme sites to highlight the work done in ensuring every child receives proper nutrition and health services, clean water and sanitation facilities, and an adequate level of care and protection. By interacting with those in the local communities we are also able to identify what more needs to be done. Nairobi, Kenya: It has been a long, tiring and dusty journey across north eastern Kenya on a mission to witness first-hand the effects of the drought that has left millions on the brink of starvation. With me on this trip is UNICEF Sweden Goodwill Ambassador Liza Marklund and Swedish photographer Martin von Krogh. Together we have travelled from Dadaab, the worlds largest refugee camp, to Liboi near the Kenya-Somalia border and their journey ends in Wajir, a drought stricken district in northern Kenya. But for me this journey is far from over. 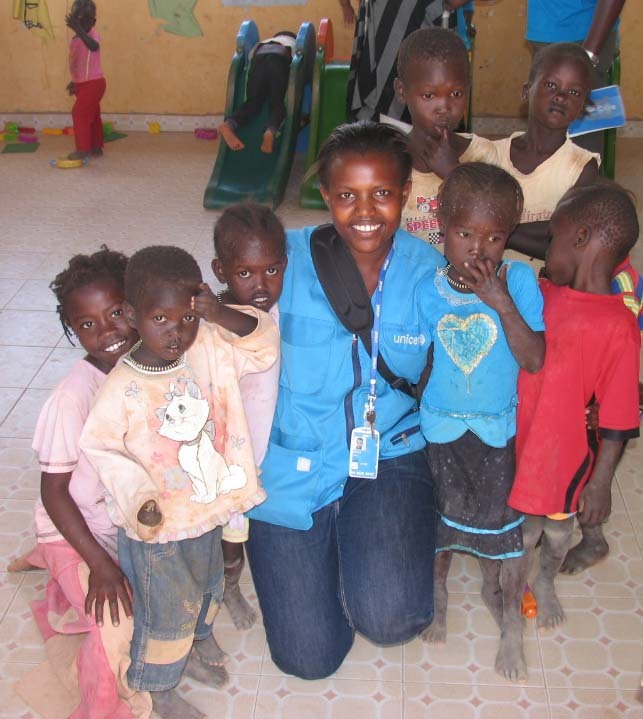 I joined UNICEF Kenya Country Office as a UN Volunteer in August 2011 and so far my most fulfilling assignments have been those in northern Kenya where an estimated 385,000 children are acutely malnourished. One week after joining UNICEF I was thrust into the thick of the emergency with a trip to Dadaab refugee camp to assist in operations in the area. I had barely learnt the ropes in the Nairobi office and here I was already on my first mission to a camp that hosts over half a million refugees, majority of these being women and children. Liza Marklund a famous author in Sweden is also volunteering her services to UNICEF on a more international scale as a Goodwill Ambassador. As we journey and work together I reflect on my role as a volunteer which has a more national and grassroots approach. It is inspiring to be able to engage with communities and understand the challenges they are facing. This is a motivating factor for any volunteer desiring to make a difference in the lives of those who need it most. To me it is indeed the very essence of my role as a UN Volunteer. In Dadaab camp, refugees are fleeing famine and conflict in neighboring Somalia and are desperately looking for a place to raise healthy and happy children. Local communities in Kenya are also not spared from the drought, and our mission reveals not only the devastation of livelihoods caused by the drought but also the various life-saving interventions by UNICEF and partner agencies that offer hope to these families. On these long and dusty trips I am often filled with an overwhelming feeling of self-worth, especially when I reflect on my role as a volunteer. Indeed this not just an opportunity for professional advancement but more so personal growth. As I look over at Liza, I have a feeling she shares the same sentiments in her work as a Goodwill Ambassador, and so do the many volunteers all over the world.